Former NBA star and “basketball diplomat” Dennis Rodman confirmed his plans to return to North Korea next week, despite the apparent power struggle surrounding the execution of Kim Jong-Un’s uncle and second-in-command Jang Song-Thaek. 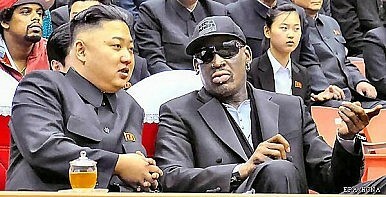 The visit will coincide with Kim’s birthday, and Rodman has promised to work with the Hermit Kindgom’s national basketball team ahead of a January 8 exhibition game. Kim Jong-Un, an NBA fan since his youth, welcomed Rodman and three members of the Harlem Globetrotters to Pyongyang last February. That trip, sponsored by Vice under a partnership with HBO, stirred controversy – but solidified the unlikely friendship between Kim and Rodman. Upon his return, Rodman described Kim as his “friend for life.” He even revealed the name of Kim’s daughter, Je-Ae, in February. Rodman’s latest trip will take place less than a month after the controversial incarceration and release of an 85-year-old Korean War veteran from the US. Even more troubling is its proximity to the violent purge of Kim’s uncle – who was allegedly killed, along with his subordinates, by a combination of machine gun fire and flamethrowers. Kim’s sudden use of force may signal an internal power struggle – at the very least, it points to a heightened sense of paranoia and erraticism exhibited by the Great Leader. Beijing-based Koryo Tours, an operator that specializes in North Korea vacations, will be hosting a special package tour for the upcoming exhibition match in Pyongyang. The four-day trip will include the same flights and hotels as the yet-to-be-confirmed NBA stars playing in the game, while providing “unprecedented” access to North Korean players and officials. For anyone bold – and wealthy – enough, the $9,000 trip can be booked through Koryo’s website.